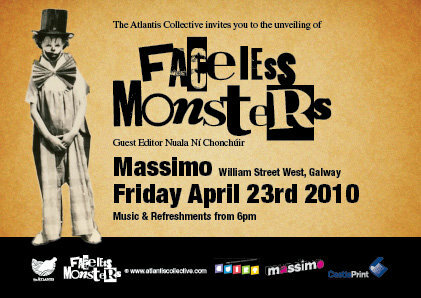 Today marks the Galway launch of ‘Faceless Monsters’, the new collection of short stories by ‘The Atlantis Collective’ of which my girlfriend is a member. This is their second collection after last years ‘Town of Fiction’ and the new book which I got a sneak peek of last night is a marked improvement. Not only have the quality of the stories improved but also the layout and presentation of the book is far superior to last years. There is a very nice foreword by guest editor Nuala Ni Chonchúir which explains what the collective is about, something I felt was sorely lacking in last years edition. The typeset is quite large but I think that its acceptable as it makes the book heavier and it looks like a proper collection. That lesson was a big one for me. I started to learn how to turn the camera off and move in for a close-up. When I watched my father direct, he would cut mid-speech because he knew that he wanted “To be, or not to be…” wide, and it was going to be a close-up for “…that is the question.” At times, it was also protective, insofar as the studio couldn’t cut around that moment. Using a low ratio of film is a rather cunning way to get your cut, but it also helps find the key to the scene. One of my favorite pieces of direction was Katharine Hepburn struggling with her “African Queen” role ever so slightly, and my father just leaned in and said, “Eleanor Roosevelt.” [laughs] It’s that economy, where another director would’ve possibly had a long explanation that would maybe leave you more confused. Great men like [Robert] Mitchum, you’d ask him: What was it like working on the film? “Yep.” Would you like some coffee? “Makes me fart.” How are you? “Worse.” At times, I suppose there’s an element of bravado to it, not overly precious behavior. That’s the epitome of cool to me, when there are men who are dealing with stuff that has great depth, but shrug it off. As anyone who knows me can testify I cut a lot of episodes of Paisean Fashion. Heres an aricle from today’s IFTN. The format of Magma Film’s reality TV series ‘Paisean Faisean’ has been bought US production outfit by Zoo Productions who have been commissioned by MTV to produce a version of the show entitled ‘Style Date’. MTV has commissioned ‘Style Date’ from Zoo Productions based on ‘Paisean Faisean’s format whereby three men buy clothes for a girl. The winning would-be stylist is determined by the girl picking one of the three assembled outfits for a date with the man whoever’s ensemble is chosen. The first three series of ‘Paisean Faisean’ were presented by Aoife Ní Thuairisg, and in the fourth by Blathnáid Nic Dhonnacha and Máiread Ni Chuaig. The fifth series sees Blathnáid present alongside Sile Seoige (pictured). The series is directed by Billy Keady, Cathal Watters (Rolla Saor) and Diarmuid Goggins (No Frontiers) and produced by Ralph Christians and Clodagh, the production team behind recent drama project ‘The Guards’. Already the show’s format has been used by a show in Turkey and Freeman confirmed a production company in Poland also recently optioned it. Dede Allen, the film editor whose seminal work on Robert Rossen’s “The Hustler” in 1961 and especially on Arthur Penn’s “Bonnie and Clyde” in 1967 brought a startling new approach to imagery, sound and pace in American movies, died Saturday. She was 86.Allen, who was nominated for Academy Awards for “Dog Day Afternoon” (1975), “Reds” (1981) and “Wonder Boys” (2000), died at her Los Angeles home days after having a stroke, said her son, Tom Fleischman.Allen was the first film editor — male or female — to receive sole credit on a movie for her work. The honor came with “Bonnie and Clyde,” a film in which Allen raised the level of her craft to an art form that was as seriously discussed as cinematography or even directing. “It’s hard to see the changes she made because most of what she did has been so fully embraced by the industry,” Faller said. Allen departed from the standard Hollywood way of cutting — making smooth transitions starting with wide shots establishing place and characters and going on to medium shots and finally close-ups — by beginning with close-ups or jump cuts. Although these editing methods had been pioneered by the French new wave and some British directors, Allen is generally credited with being the first to use and shape them in American film. In Sidney Lumet’s “Dog Day Afternoon,” she employed a staccato tempo, sometimes called shock cutting.”She creates this menacing quality by not cutting where you’d expect it — she typically would cut sooner than you might expect,” Faller said. “You weren’t ready for it.”She would also begin the sound from the next scene while the previous scene was still playing, a technique now standard in film editing. 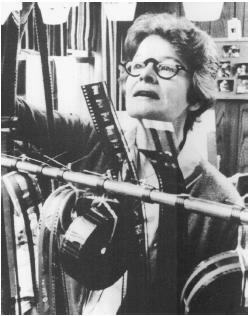 In all, Allen edited or co-edited 20 major motion pictures over 40 years, but she was most closely identified with Penn and a handful of A-list directors such as Rossen, Lumet and George Roy Hill and actor-directors Paul Newman, Warren Beatty and Robert Redford. But it was the violent tale based on the true story of Bonnie Parker and Clyde Barrow — lovers and robbers on the run during the Great Depression — that secured her place as a pioneer in film. Hardly a chase scene or violent sequence filmed since “Bonnie and Clyde” has not been a reference to Allen’s distinct style, which she developed under Penn’s direction. “What we essentially were doing,” Penn said Saturday, “was developing a rhythm for the film so that it has the complexity of music.” The famed final ambush scene in which Bonnie and Clyde are gunned down on a gravel road in rural Louisiana contains more than 50 cuts, though it lasts less than a minute. At Penn’s urging, Allen and her assistant, Jerry Greenberg, employed slow motion at some points and faster speed at others, creating a tense, violent and balletic conclusion. Although the film initially left some movie critics in near-apoplectic disapproval of its mix of comedy and graphic violence, Pauline Kael, writing in the New Yorker magazine, called it “excitingly American.”Kael had special praise for the movie’s editing, especially the “rag-doll dance of death” at the end of the picture, which she called “brilliant.” “It is a horror that seems to go on for eternity, and yet it doesn’t last a second beyond what it should,” Kael wrote. Dorothea Corothers Allen was born in Cincinnati on Dec. 3, 1923. She attended Scripps College in Claremont but left to take a job as a messenger at Columbia Pictures, hoping she could someday fulfill her dream of being a director. Within a year, she was an assistant in sound effects, working on three-reelers. After long hours at her job, she would sit beside Carl Lerner, then an editor in television who later edited “Klute” and other films. With Lerner’s guidance, she learned the craft of editing: the assemblage of various scenes to create a coherent film. In the early days of Hollywood, the cutters, as they were called, were often women, perhaps because, as Allen once commented to author Ally Acker, “women have always been good at little details, like sewing.” But later those jobs mostly went to men, especially after World War II when military veterans returned to the film industry. Unable to get a stronger foothold in the movies, Allen went with her husband to Europe and then New York City, where she took various jobs, including editing commercials, while raising her two children. Working on commercials helped shape her style of editing, she often said. In the late 1950s, Lerner recommended her for her first major editing task — for director Robert Wise’s “Odds Against Tomorrow,” the taut film noir starring Harry Belafonte. Ebert wrote of Allen’s work on “The Hustler” that she found the rhythm in the pool games — “the players circling, the cue sticks, the balls, the watching faces — that implies the trance-like rhythm of the players. Her editing ‘tells’ the games so completely that if we don’t understand pool, we forget that we don’t.” When “Bonnie and Clyde” came along several years later, Allen employed her well-honed techniques and instincts about performance and story to help Penn deliver a film unlike any made in America before. In 1994, Allen received the highest honor from her peers, a career achievement award given by American Cinema Editors. In November 2007 she received the Motion Picture Editors Guild’s Fellowship and Service Award. For seven years during the 1990s, Allen was an executive at Warner Bros., overseeing pre- and post-production on many films. She returned to editing with “Wonder Boys” and was co-editor of Omar Naim’s “The Final Cut” (2004) and editor of “Fireflies in the Garden” (2008). In addition to her son, Tom, a sound recording mixer, she is survived by her husband of 63 years, Stephen E. Fleischman, a retired TV news executive, documentary producer and writer; daughter Ramey Ward; five grandchildren; and two great-grandchildren. Just click on the pages on the right to see examples of work and so on. I’m still tracking down old stuff and I have to upload loads more things. I’m still also figuring out how to work wordpress!